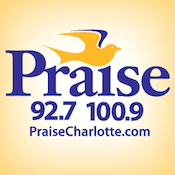 Following the launch of Radio-One’s “Old School 105.3” WNOW-FM, we’ve been waiting for the next show to drop in the company’s makeover of its Charlotte cluster. At 12am this morning, Urban AC “My 92.7” WQNC gave way to a simulcast of sister Gospel “Praise 100.9” WPZS. While we expect that eventually 100.9 will slide to a new format as both stations have considerable overlap in their reach, this does appear to be a simulcast that will be around for the near term. I guess 100.9 will battle WPEG soon.